Beyond the business side, company officers emphasize the importance of giving back to the community and ensuring their employees have time for their families and their faith. The biggest piece of the nonprofit is the Buffalo Soccer Club, which over the years has provided an athletic outlet for nearly 600 young people, most from Buffalo’s East Side. The company’s three founders are Raines and David M. Thiemecke, who met at Orchard Park High School, and their friend, Adrian A. Roselli, who later attended the University at Buffalo with Raines. The trio was working in the Internet division of SOFTBANK Services Group when they decided to form their own technology-services company. The name, an inside joke from their school days, borrows from the Algonquin Round Table, the widely quoted group of writers and other wits who gathered at New York City’s Algonquin Hotel in the 1920s. “We went around, we tried to come up with a good name for what we were going to do, we couldn’t come up with anything, so, Algonquin Studios,” Raines said. Sadly, there just wasn’t room to go into our college-era weekly concert-series-slash-coffee-house called Algonquin Table, or our every-semester music fest called Algonquinpalooza. If it’s not obvious, we’ve sort of had a theme for a while now. 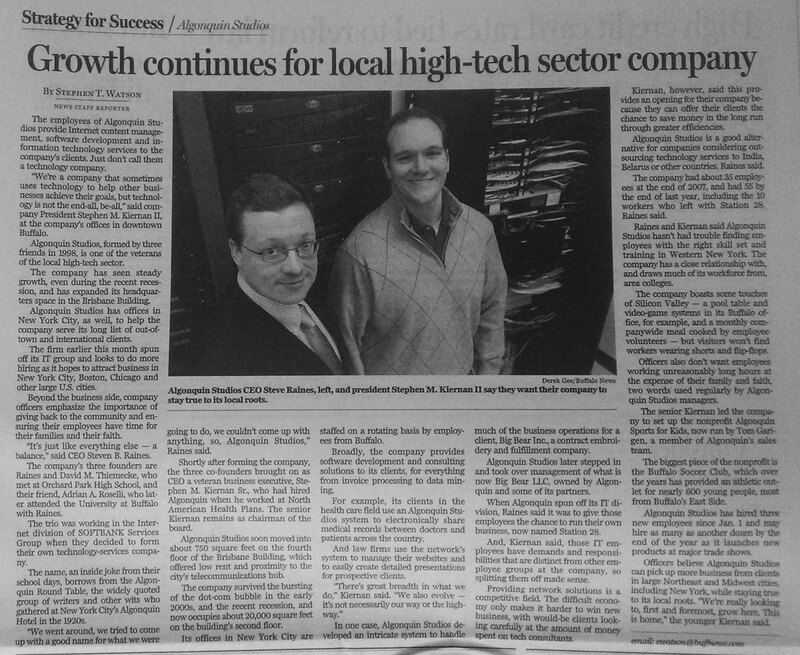 You can read the full article at the Buffalo News web site (Growth continues for local high-tech sector company) or follow the link on the photo at the top to see the terrible Sunday morning camera phone photo of the article in the paper (or just follow that link).